Figured we could start out the new year with a cautionary tale. The following first-person account was shared by CRR Rachel Strickland, whose foot, yes, still hurts after having run two shorter races in lieu of one longer one. …I had signed up to do the half marathon of the Best Damn Race in Safety Harbor, Fla., a race I had done seven years ago for its inaugural run. They have really fun medals. My foot hurt so bad on my last training run the previous Sunday that I could only do five miles and had to walk a lot of that. The race organizers let me transfer to the 5K/10K Challenge. Still 9.3 miles, but I saved nearly four miles of pounding on my foot. I did the 10K at 7 a.m. then the 5K at 9:00. I got a medal for each event and a third for having done the combo. It hurt every single step, so probably not the best decision (hence the meme about being in denial). This is the same injury that kept me from doing the Wring Out the Old [at the end of 2018], but it seemed like it had been getting better. I like to practice medicine without a license and know a little about anatomy, but I’m seeing a podiatrist this week to find out what the problem is, and, hopefully, I’ll have a real diagnosis. Likely a long time away from running in order to rehab. Just as well, because cycling season is just around the corner, and I can start training (I have the bike hooked to a trainer in the basement) for the Monkey Knife Fight on April 6—a 30-mile hilly ride in Emmaus, Pa.
Oh well, you just can’t keep some runners down. 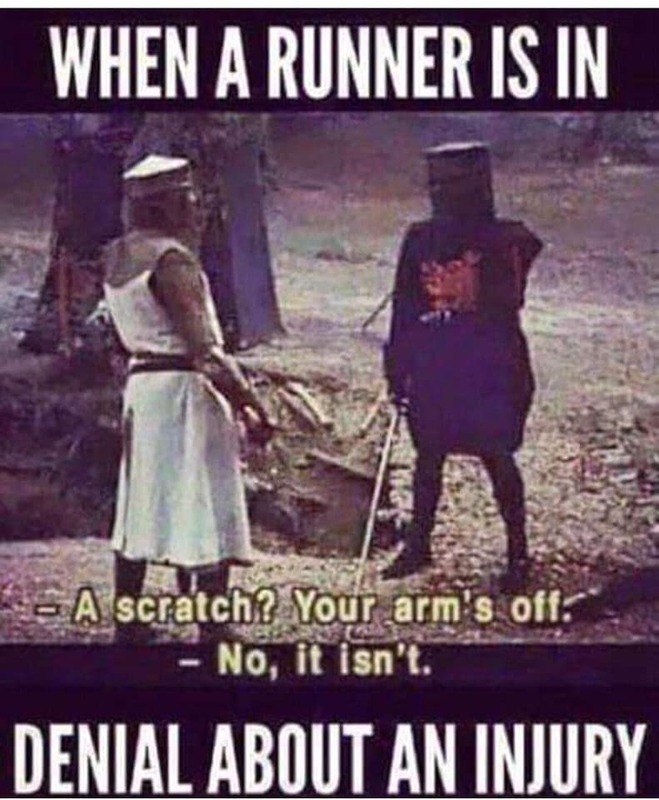 But, as a general rule, we don’t recommend running injured. Stay healthy in 2019 everyone! Three Creek Road Runners showed up in a big way for the Grape Stomper trail 5K at Paradocx Vineyard in nearby Landenberg, Pa., on Friday, Oct. 5. CRR Andrew Weber placed second overall, out of 206 finishers, in 19:26, easily winning his 30-39 age group. 59-year-old CRR Bill Rose was the first male masters finisher, placing 8th overall in 22:37. CRR Natalie Rosenberg won the 30-39 age group, finishing 18th overall in 24:23. Finishing 32nd overall was the female masters winner CRR Christina Parsons in a time of 26:30. It was also nice to see that CRR Chris Knight got into the action as well. Knight finished 41st in 27:31.